Ever been to a blogger's event not knowing what to expect? Well, sometimes that could be disappointing OR effing great. In my case, it simply turned out to be spectacular! 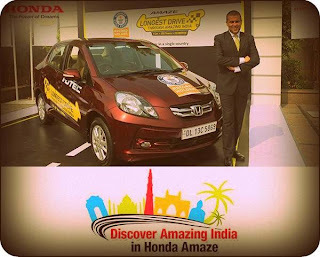 On November 7, I received an invite from Bloggers' Mind – a social media agency that works with various brands across the Automotive, FMCG, Technology, and Lifestyle sectors – to come and celebrate the completion of the "Longest Drive through Amazing India", part of Honda's "Amazingly Indian" campaign. Not only did I graciously accept their invitation, but I also volunteered to cover the event for them as a return gesture. What I didn't realize was that I'd get to witness a Guinness Award Ceremony firsthand. Also, get to click selfies with Chetan Bhagat, author of bestselling novels like Five Point Someone (2004), One Night @ the Call Center (2005), The 3 Mistakes of My Life (2008), 2 States (2009), Revolution 2020 (2011), What Young India Wants (2012), and Half Girlfriend (2014). Have I gotten you interested yet? Here's the scoop on the event as it happened. But first about the Guinness World Record. 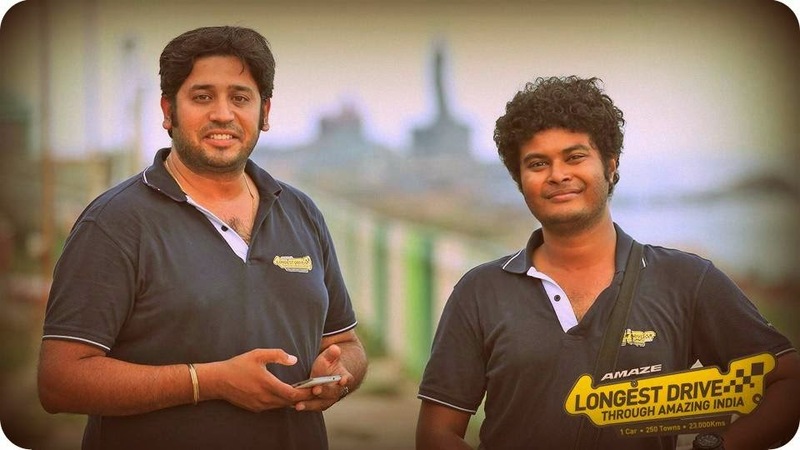 Bunny Punia (Associate Editor at Gaadi Web Pvt Ltd) and Shantonil Nag (Content Writer at Gaadi Web Pvt Ltd) created history for covering the longest journey by car in a single country. 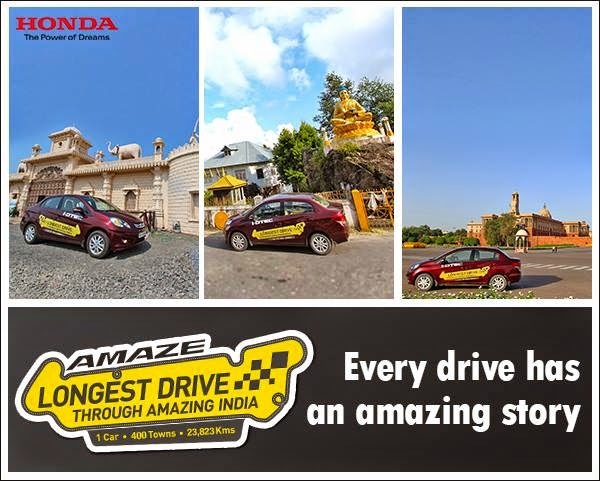 Together, they covered a distance of 23,823 Kms in 1 car (Honda Amaze) across 400 towns and cities of India. Rajender Singh Negi - for capturing experiences in the Video format. Deepak Dhojia - for editing and making live videos. Kanika Sood - for playing the quintessential multitasker in this epic drive event. The Gaadi Web Pvt Ltd team (including Abhishek Chaliha, Shivank Bhatt, Jeo George, Siddharth Motu, and Kanupriya Bhatnagar) - for handling everything else. This drive was flagged off from the city of Jodhpur on September 15, 2014 and culminated at Greater Noida. 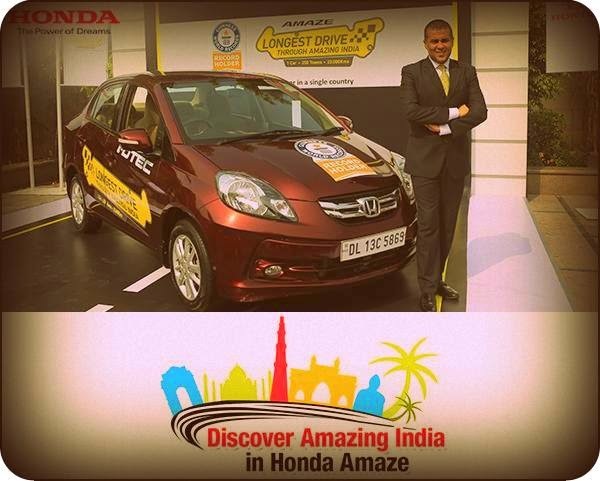 Honda revealed that the family sedan, Amaze, has seen a tremendous response from customers in India. In just 16 months since its launch, the product reached the 100,000 sales milestone. Undoubtedly, the fastest in the history of Honda Cars India Ltd (HCIL). The Honda Amaze was also declared the “Car of the Year” and “Compact Sedan of the Year” by leading automobile magazines, clinching 12 major automobile awards in 2013-14. HCIL celebrated this success by organizing the "Longest Drive through Amazing India" initiative. The "Longest Drive through Amazing India" is followed by a series of webisodes on "Drive through Amazing India" led by the renowned author Chetan Bhagat. In this web series, Chetan will travel to unexplored places of India. His first destination will be a church submerged in the waters. No kidding! 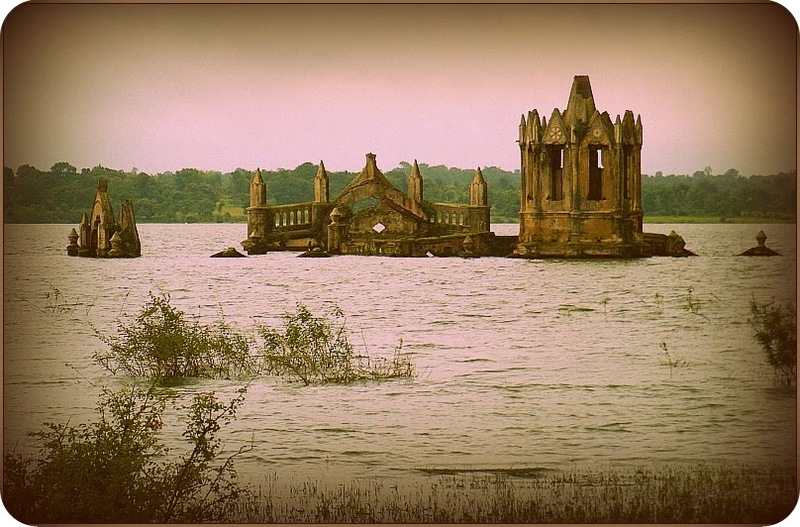 Not explored by many, the ruins of Rosary Church lie unscathed in Shettihalli, Hassan, Karnataka. The water recedes during summers, a time when you can get to see the church up close and personal. Even when the church is submerged - half under the water - you can go near it on a coracle. You too can be a part of this exciting journey with Chetan by participating in the upcoming contests, wherein you'll be asked to post stories or photos about unexplored places of Amazing India. The shortlisted candidates get to travel and explore the most remarkable places of India, just like the man himself. It DEFINITELY pays to be a blogger! Sometimes the perks come in the form of opportunities and can be enough to justify the trouble like waking up early on a lazy Sunday morning. Thanks Jyotika for your encouraging words.